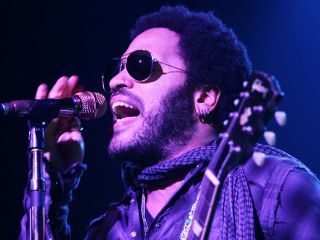 Lenny Kravitz to replace Steven Tyler in Aerosmith? Is Kravitz gonna go Aerosmith's way? Lenny Kravitz is the "only person" who could replace Steven Tyler in Aerosmith - this comes from the band's former A&R man John Kalodner. But should that happen, and it's still speculation at this point, Kalodner says it wouldn't really be Aerosmith without Steven Tyler. Kalodner, who worked with the band for over 20 years, masterminding their spectacular comeback in the '80s and '90s, told Rolling Stone, "I'm never surprised at what happens to bands. They're dysfunctional families but some are just better at managing it, like Bon Jovi and U2. Aerosmith should be in their league - but they're not now. As for Steven Tyler and his suggestion to work on 'Brand Tyler' in 2010, Kalodner said, "Steven Tyler is one of the most talented artists I ever worked with. It's possible he'd be successful but I think the big success would always be with Aerosmith. "Twenty years ago Mick Jagger tried it and it was a disaster. Lou Gramm (Foreigner), Steve Perry (Journey) - all these incredible singers. It just doesn't work that way. A band is a certain unique entity." Despite a friendly onstage reunion with Tyler last month, Joe Perry is still unconvinced that a true reconciliation with the singer is possible, and he's on the search for a replacement. Speaking to CNN, the guitarist said, "We have a short list and are talking to a lot of people. I found the singer for my band [The Joe Perry Project] on YouTube, so there's no reason why we can't do the same." Perry also that interested singers send in CDs, videos, etc. to Aeromith's management. Even so, Kalodner would very much prefer to see the band stay as they are. "How can it be our Aerosmith without Steven Tyler? I don't know their politics but if you're asking me, Is there Aerosmith without Steven Tyler, my answer is no. And if Steven Tyler goes solo my answer is no."